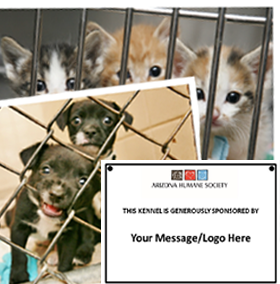 Each adopted kennel provides the shelter with resources to provide everything the pet needs for thei stay at the Arizona Humane Society until they find their forever home. Your personalized message will be displayed on a kennel at our Nina Mason Pulliam Campus for Compassion for a minimum of three months. If you prefer to mail in your donation, download a Tribute Form.